Thanks to hard work, dedication, and the mapping of just about every move and sound cue in the game, a blind gamer has finally completed Legend of Zelda: Ocarina of Time. 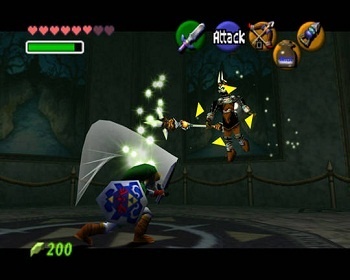 Last July the Escapist reported a blind gamer from Ontario, Canada by the name of Jordan Verner was attempting to complete Legend of Zelda: Ocarina of Time. With the help of four gamers from around the world, he has finished this endeavor, thanks to two years of dedication. The gamers ran through the dungeons, recording all the sounds and writing detailed descriptions of the movements they made with Link and the positions of the enemies, which would then be submitted to Verner, whose computer would read it to him. "When I was younger, a doctor told me I was going to go blind, which turned out not to be so," said Roy Williams, a Camden, South Carolina resident who was involved in the project. "But it scared me and I was like 'I want to be here to help this person get through his disability.'" With the level of effort and dedication that went in to the process, finally beating the game is a huge achievement. "It felt great, I felt strong, I felt the sky's the limit," Jordan said. This really shows the drive and dedication of the gamer community, and the power of the gaming experience. Hats off to Jordan, Williams, and the other gamers who contributed to this project, they've done something truly great.